The CXC performs standard data processing (SDP) on all Chandra science data; this procedure is commonly referred to as "the pipeline." The processing runs in several stages or "levels", each of which is built on the results of the preceding level. A well-defined set of data products are the result of each level. For most cases, the level 2 (L2) - or L1.5 for grating data - data files should be used. The level 3 (L3) products are available from the Chandra Source Catalog (CSC). This thread examines the primary and secondary Chandra data products which were obtained by following the How to Download Chandra Data from the Archive thread, which uses ObsID 1843 (ACIS-I, G21.5-0.9) as the sample data. Filenames given in brackets - e.g. [hrc_dtf1.fits] - indicate a data product that is not created for ACIS imaging observations; this makes the thread applicable to any standard Chandra data distribution. and then reprocess the data (e.g. with chandra_repro), to ensure that the latest calibration products have been used. This steps should be done before you start your analysis. Last Update: 18 Dec 2014 - Reviewed for CIAO4.7; fixed typos. When a Chandra observation is taken, it is processed through the Standard Data Processing (SDP) pipeline, and the results stored in the Chandra archive. Occasionally the Chandra X-ray Center determines that there have been enough improvements to the software, or changes in the calibration products, that the archive - or a significant fraction of it - has to be reprocessed. This means that new version of the files will be created; so, if you downloaded an observation a long time ago, it is worth checking the archive to see if a new version is available. At the time of writing (May 2013), the last reprocessing run was Repro IV. The current processing status, and history, of an observation can be found from the Chandra Observations Processing Status page. For ObsId 1843, the page looks like Figure 1 as of May 2013. The final table on the page shows that the data has been processed three times, the last time being in September 2012. This is why the "version number" for many of the files is N003 - e.g. acisf01843N003_evt2.fits. The note on processing versions thread explains the version names used for the SDP pipeline, and how to check what version was used to create a particular dataset. All standard data products are checked by a CXC scientist before release to ensure data quality and to investigate the cause of any exposure losses or other anomalies. This process is known as "verification and validation", or V&V for short. The V&V report is distributed in PDF format with the data files. This file contains a summary report of the V&V report. The full report is in a second PDF file (axaff01843N002_VV001_vvref2.pdf), which is packaged in the secondary data directory. Users should review this information before beginning the analysis to ensure that there aren't any caveats from the V&V scientist. The observation index file contains a summary of the data products associated with an observation. It is equivalent to a structured directory listing with descriptive information about the observation. Each observation includes an ASCII README file that provides information on how to cite Chandra data in publications, how to acknowledge usage of CIAO, Chips, and Sherpa, and how to use the Chandra X-ray Center as a long term repository for aggregated high-level science data products. In particular, the CXC encourages users to include Dataset Identifiers in their publications. In the following sections, we describe the contents of the primary and secondary data directories. The data products are arranged such that all products necessary for most analysis (e.g. the CIAO threads) are in the primary directory. For a small number of observations the output will look different to above, because the observation was taken in interleaved mode - in which case there are two versions of certain files, labeled with e1 and e2, - or it is a multiple observation interval observation - when the level 1 and 1.5 data products can have multiple versions. Two images are produced for every dataset: a full-field sky image (full_img2.jpg) and a high-resolution image of the center of the field (cntr_img2.jpg). FITS images are only created for imaging observation (no gratings). The images have no energy filter applied. Images are not created for ACIS operating in continuous clocking mode. The level 2 event file is the most important data product you receive. This file is created from the level 1 event list by filtering on the good time intervals (GTI) and status bits. The result is a list of events that is suitable for use in data analysis. When new calibration is released, it is often necessary to remake the level 2 event file in order to apply the changes. This process is explained in the Create a New Level 2 Event File thread. A source candidate list. These detections are obtained from a single run of celldetect with S/N threshold equal to 3 and should not be used directly in your analysis. Users interested in spatial analysis should perform their own detection runs with one of the three Chandra Detect tools: celldetect, wavdetect, and vtpdetect. The Detect Manual describes which tool is suited to a particular analysis. For instructions on displaying the source list over the data, refer to the Using the Output of Detect Tools thread. This file is only created for imaging observations. The Reprocessing Data to Create a New Level=2 Event File thread contains more information, including instructions on how to make a new ACIS bad pixel file, if necessary. The New Observation-Specific HRC Bad Pixel File thread explains when and how to make a new HRC bad pixel file. This file has been created since SDP version 6.9.0. The skyfov tool may be used to create an fov1.fits file for observations with an earlier processing version. These files are used in the Chandra FootPrint service for searching the archive of publicly-available observations. The definitive orbit ephemeris information for the observation. This file is required if you wish to barycenter-correct the observation times in order to account for the difference in photon arrival times as the Earth and Chandra move around the Sun. The orbit ephemeris is also needed if you are analyzing an object which was moving with respect to the observer when observed, e.g. a planet or comet. The aspect solution describes the orientation of the telescope as a function of time. The detected position of an event and the corresponding telescope aspect are combined for an accurate determination of the celestial position of that event. Since an aspect solution file is created for each stable aspect interval, there may be more than one pcad_asol1.fits file for an observation. All the files must be used whenever a tool requires the aspect solution as input. Detailed information on the aspect solution files is available from the the Aspect Solution why topic. The dead time correction factors as a function of time. For ACIS observations, the dead time correction is recorded in the DTCOR header keyword. Since the HRC dead time correction factor varies during the observation, however, the value of DTCOR represents an average and the individual values are stored in the dtf1.fits file. The Computing Average HRC Dead Time Corrections thread explains when you might need to recompute the deadtime statistics for your observation. This file is only created for HRC observations. The PHA file contains a spectrum for one grating part and order in each row of the file. The number of rows varies depending on the detector and grating combination: e.g. ACIS/HETG data has twelve rows while HRC/LETG only has two. Detailed information on the pha2.fits file is available from the Examining Grating Spectra and Regions thread. This file is only created for grating observations. If you are interested in reprocessing your data, you will also need the level 1 files, which are in the secondary directory. The V&V report - axaff01843N001_VV001_vvref2.pdf - is explained in the ObsID Directory section. A set of offsets versus time (e.g. ra_off=(ra-ra_nom)) . The one piece of remaining useful info is information about gaps in the aspect records. These are derived from the aspect solution files (pcad_asol1.fits, primary directory) for the observation. Most users will never need this file in their analysis, instead using the aspect solution files directly. The level 1 event file contains all the events recorded for the observation. While many of these events have a status bit set to flags them as "bad", none of the information has been removed. This file is filtered on GTIs and status bits to create the level 2 event file. The evt1.fits file is also the starting point for reprocessing your data, as explained in the Create a New Level 2 Event File thread. The ACIS or HRC Level 1.5 event file is created for observations that used the gratings (LETG or HETG). The file contains additional columns related to the gratings including the grating order , which arm (eg HEG vs MEG), and the resolved grating wavelength. All these values are based on the zeroth order location used in the processing. The zeroth order location the regions assigned grating coordinates is contained in the REGION extension which is appended to this file. The GTI information for the observation, e.g. the start and stop times of all accepted time intervals over the observation. The major contributor to creating GTIs is information about when there is aspect data and when that aspect data is good. When the event file is filtered, the GTIs are stored as extensions of the data file, creating a dynamic record of the time filters applied to the data. Note that this file is named slightly differently for ACIS (flt1.fits) and HRC (std_flt1.fits) observations. The mask file records the valid part of the detector element - ACIS CCD or HRC plate - used for the observation (i.e. the portion for which events can be telemetered). The active portion of an element may be smaller than the default regions if an observation was performed using subarrays or custom windows. This information is used when creating response files, such as ARFs. The mission timeline (MTL) consists of all time series data that affects the quality of the data, such as aspect and ephemeris data. This information is used to construct the GTI limits in the flt1.fits file. The MTL ahelp file has more information on the mission timeline. This file is required by acis_process_events to apply the temperature-dependent CTI calibration to ACIS data. The science instrument module offsets versus time. These are derived from the aspect solution files (pcad_asol1.fits, primary directory) for the observation. The soff1.fits file is binned, so there's not a one-to-one match to the rows in the pcad_asol1.fits files. The exposure statistics file contains up to seven extensions, each pertaining to the sequence of ACIS CCD exposures processed and recorded into telemetry. Most users will never need this file in their analysis. This file is only created for ACIS observations. The dead time factor statistics information is derived from the HRC deadtime factor file (dtf1.fits, primary directory) for the observation. When the bad pixel list (bpix1.fits) is created, each bias map is searched for pixels whose bias values are either too low or too high. There is one bias map for each ACIS chip that was used for the observation. These files are only created for ACIS observations. The parameter block file is needed in conjunction with the bias maps when creating a new bad pixel list. It is used to determine observational parameters, such as which CCDs are active, the READMODE and DATAMODE, etc. Most users will never need these files in their analysis. Ground-based aspect analysis, which produces the asol1.fits files (primary directory), gives a better product because more information is available. There is a special case when the osol1.fits files may be used. The pcad_asol1.fits files are only produced when Chandra is in Kalman lock and on the target. The osol1.fits, however, are always produced. Since HRC is "always on" when it's the chosen detector, it records events while it is slewing between targets; these events are included in the evt1.fits file. There is no Kalman lock aspect solution for these events,which is why sources in HRC evt1.fits files often have "tails". If you really want to use those extra events that were taken as the telescope was moving into position, you can in principle use the osol1.fits files for the analysis. Observations that requested the aspect camera also acquire optical monitor data of the target source will also contain adat71.fits files which are used in the ACA Montior Data thread. Most users will never need these files in their analysis. When a tool requires the ephermeris information, it is referring to the orbit ephemeris (orbit_eph1.fits) from the primary directory. 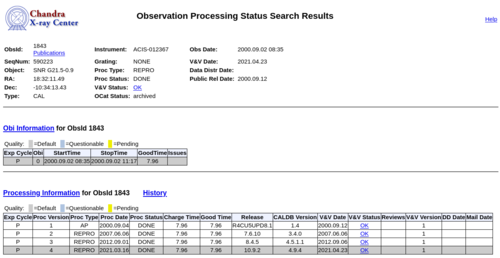 Once you have checked the V&V report for the observation, you should reprocess the data. This ensures that the latest calibration products have been used, and is often one of the first things we ask users of the Chandra HelpDesk. 28 May 2013 Added more text to the synopsis and new sections: Archive versions and What next?. 16 Jul 2014 Updated for evt1a files in secondary directory. 18 Dec 2014 Reviewed for CIAO4.7; fixed typos.